There are over 3 million pesos in prizes this year, among them a pickup truck, seven cars and fishing gear, as well as high daily jackpots and cars for those who break the current Marlin and Sail Fish records. La Cruz de Huancaxtle, the Nautical Capital of the Riviera Nayarit, will be ground zero for the 4th Annual De La Cruz International Sport Fishing Tournament from September 28th through October 1st of this year, putting to the test both the facilities of the Marina Riviera Nayarit and the capacity of the fishermen to make the best of what the Bahía de Banderas has to offer. The four categories include: Sail Fish, Marlin, Dorado and Tuna. This year they expect to surpass the 52-boat record, as there are already over 40 boats registered. The registration cost per boat is USD$2,000. Participants include anglers from 12 Mexican states as well as the United States, Canada and even one from Korea. 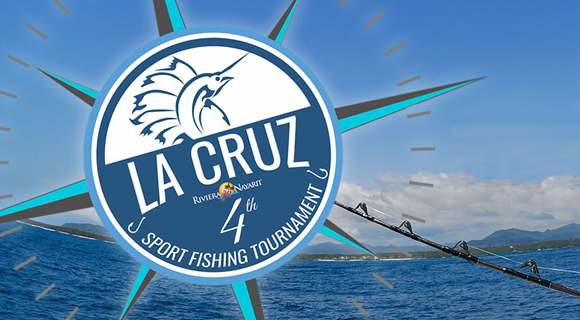 “This has been organized with the best of intentions by the Riviera Nayarit; obviously by the CVB, represented by Marc Murphy; the Inapesca; the Marina Riviera Nayarit and all of the sponsors who are working with us,” declared Miguel Sierra Quintana, President of the Board of Directors for the Tepic Sport Fishing Club. The first place winner in the Sail Fish category will take home an NP 300 truck; second place will take home a March; third place will drive off in a new Tsuru; and fourth place takes home a new set of fishing gear. The winners of the Marlin, Dorado and Tuna categories will each take home a March for first places and fishing gear for second and third places. The cars are all 2017 models. Winners will also take home a commemorative trophy. Special prizes this year are two Tsuru cars for those who break the 52.5kg record for Sail Fish and the 325kg record for Marlin. The jackpots this time around are very interesting, running from USD$100 to USD$200 per boat per day, which will generate plenty of economic stimuli. There will also be a free Junior Tournament held on October 1st starting at 7 a.m. for children ages 6 to 11, divided into three categories. There is a limit of 250 participants for this event. The National Fishing Institute (Inapesca by its acronym in Spanish) will be in charge of recording the measurements and weights of the catches in order to call out the winners. They will also use these and other parameters to generate research indicators and help maintain the balance of the species.